Another thing we’ve learned is a lot of you have Gmail accounts and it only seems reasonable to assume that those of you with Gmail accounts have a lot of contacts in Gmail. 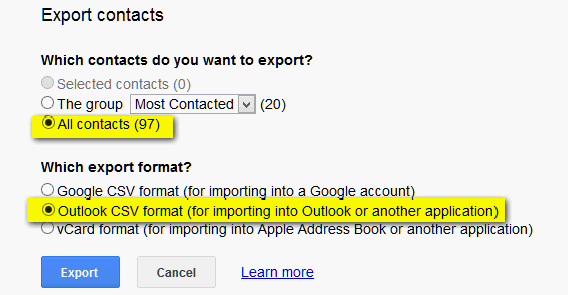 We’ve been asked many times how to export Gmail contacts for use in other email programs such as Windows Mail, Outlook Express, Outlook, Thunderbird, etc. So we’re going to show you how easy it is to export your Gmail contacts in CSV format (the format that almost all Email program recognize). When you click Contacts, another dialog appears. Click on Export. See? 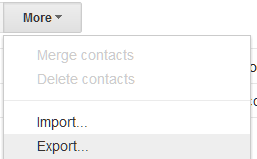 When you click on Export you’ll be able to choose the contacts you want to export (we’ve selected “All”) and the format in which you want to save your contact list. Almost always you’ll want to choose “Outlook CSV” because this is a standard format recognized by the vast majority of email program. Once you’ve selected the contacts you want to export and the format in which you wish to export your contacts list, just click the blue “Export” button. 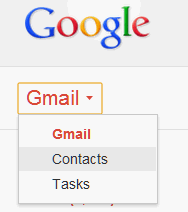 Your contacts list will be downloaded to your computer where you can import it to most email programs by clicking on “File” “Import” and choosing CSV format and then browsing to the file you downloaded from Gmail.